Concentrated Amandine Pear Aroma by Supervape. 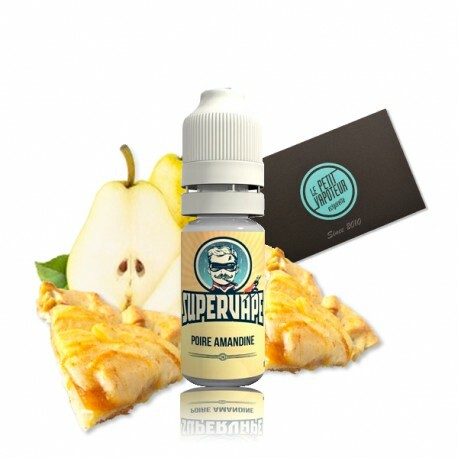 Supervape invites this famous, unmissable gourmet dessert and shortbread tart. Straight to the point this shortbread tart, it marries well with creamed almonds slightly caramelized. Of course, it is possible you can add your gourmet flavours such as vanilla custard for example. 10ml Plastic Bottle. Conentrated Aroma recipes must be diluted in the base. Do not vape the aroma directly. A French Range for Superdiyers ! Concentrated Supervape Aroma is ready to use for your DIY e-liquids. The aroma must be diluted in neutral base. Supervape, has elaborated there recipes with the skills of an expert perfumer, and tested these creations by independant tasters. For the aromas, they are used essentially with natural fragrances. However a nautral aroma can present an allergy risk for our consumers as low as they are, they are tested in such cases and validated in a laboratory in accordance with the IFRA (International Fragrance Research Association). The Supervape aromas are made in france, by the laboratory Lips France, in Loire Atlantique. Advised Dosage : Between 5 and 10% of the Supervape aroma must be diluted in the neutral base. Thanks to the QR Code system, unique in the world, you can find all the information concerning the product directly on line. Grosse déception. Pas de goût de poire, uniquement le goût 'amandine&quot; très artificiel. Pris pour la 1 ere fois , un peu déçu par le peu de gout. Tres bon à la vapeur..!